Amethyst, a beautiful young girl, was on her way to worship the mythological goddess Diana when tigers, from the orders of the Greek God Bacchus, were about to pounce on her. In order to save Amethyst, Diana immediately froze the girl into clear crystal. Bacchus, in his grief, poured grape juice on the crystal. Henceforth, Amethyst glowed a beautiful shade of purple. Derived from the Greek word “amethustos”, the gemstone amethyst has been believed to calm anger, relieve frustrated passions and prevent intoxication. Originally mined in the Russian Ural Mountains, the reddish, purple stone was traded throughout Europe. Collected and treasured for its mystical qualities by many different tribes, the oldest amethyst objects found in excavated gravesites dates to 7500 B.C. in the areas of France, Switzerland and Spain. Egyptian amethyst beads and amulets were discovered in tombs dating to 3100 B.C. Brazil and Uruguay are currently the major sources of amethyst. Amethyst crystals are found in the lining of volcanic rock cavities. Created approximately 130 million years ago, the crystals were formed as gas bubbles became trapped in the cooling volcanic lava when water percolated through the rock and dissolved silica. When the iron atoms replaced the silica, the color is created in a mixture of red and blue. The color varies, ranging from pale lavender to a deep violet, depending on the concentration of iron atoms within the crystal. Amethyst quartz can grow into a large size and has hardness on the Mohs’s scale as a seven. Amethyst is the most valuable of all the crystalline quartz varieties. The most valuable amethyst is clear of inclusions with a deep uniform purple color with a hint of red. Found in small quantities all over the world, amethyst has been revered by different cultures. The Cherokee Indians from North America believed the amethyst to be a living object and “fed” it by rubbing the blood from the animal that they hunted. Worn as an amulet to sharpen the intellect and for protection against harm in battle, amethyst was the chosen stone of the Roman Army generals. The finest amethysts have been used for ecclesiastical purposes since medieval times—the ring worn by the Pope is set with a large amethyst. 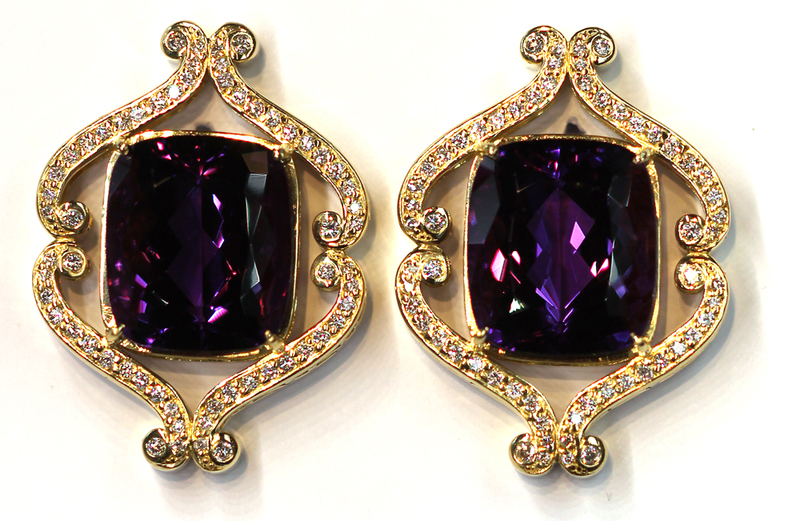 Amethysts designed with pearls in small rings, earrings and pendants were popular during the Victorian era. And in the late 1800’s and early 1900’s, Tiffany designed several collections of jewelry with amethysts combined with colorful gems. After the war, in the 1940’s, large amethysts were set in scrolls of gold—in a popular exaggerated art deco style. Hollywood actresses wore the deco style jewelry set with amethyst, citrines and aquamarine as the centerpiece, with small rubies, sapphires and diamonds sprinkled around the setting. Bulgari opened in Rome in 1881 and became famous, as we know it today, with their incredible colorful jewelry. By using amethyst in their jewelry, they propelled the romance of the stone into popularity in the 1950’s and 60’s. Cartier in Paris created one of the most famous amethyst necklaces in 1941 for the Duchess of Windsor. 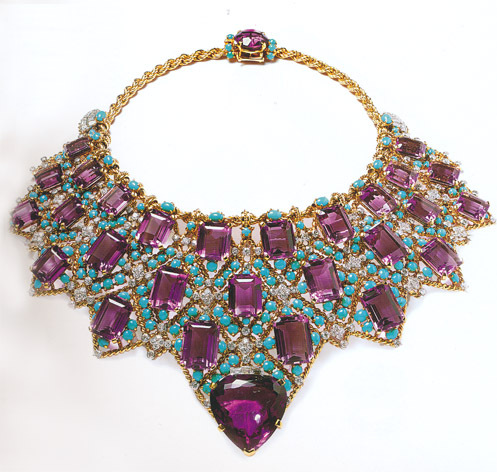 An innovative styled ‘bib’ necklace combined 158.9 carats of crystal amethyst with 10.66 carats of diamonds and 33.65 carats of opaque turquoise beads set in 18k yellow gold. The centerpiece is a large heart shaped amethyst with three baguette diamonds. Diamonds set in platinum were traditionally worn for evening wear—and the newly created amethyst and turquoise ‘bib’ necklace, in yellow gold, was a groundbreaking style for the time. This necklace was on display at the Legion of Honor, San Francisco for “Cartier & America” exhibition until April 18th, 2010. I contributed to the audio tour for this exhibit. Regarded by the Japanese as the “perfect gem tama”, amethyst is a symbol of purity, patience and perseverance– all which represents the infinity of space and time.